I claim no familiarity with Mike Judge’s TV work. Beavis and Butthead were before my time, and I’ve never had the slightest reason to ever watch King of the Hill. However, I am very familiar with Office Space, quite rightfully the office comedy by which all other office comedies are measured. Though a box office flop upon release, Office Space has become such a widely influential satire that even those who’ve never seen the movie can recognize the references. I doubt there’s one person in a hundred who’s never heard of a TPS report, and I know for a fact that everyone on God’s green earth has dreamed about recreating the “baseball bat” scene on some obstinate piece of technology. History seems to be repeating with Idiocracy, Mike Judge’s second live-action movie. The film was released in 2006, in spite of distributor 20th Century Fox’s efforts to bury it. Fox delayed the movie’s release by a full year, refused to screen it for critics, did absolutely nothing to promote it, and only released the film on 130 screens nationwide. The grand box office total: Half a million dollars worldwide. Judge gave King of the Hill to Fox, and this is how they repaid him. Shameful. 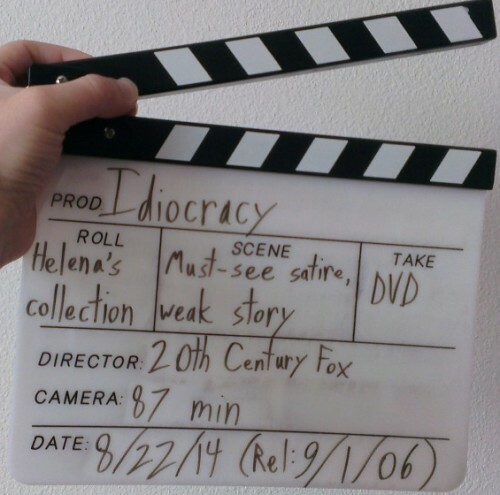 A few years later — as further evidence that studio distribution means increasingly little in the internet age — Idiocracy is a cult classic with a premise far more influential than the film itself. Long before I had ever seen this movie, I had heard (and even used) the title as shorthand for a near-apocalyptic world in which everyone is too fat and stupid, too spoiled by rampant commercialism and brain-dead entertainment, and too protected by the medical miracles that preserve the suicidally brain-dead, to keep the world from collapsing on itself. It’s a satire that seems to only get more relevant, such that you have to wonder if the movie is a work of fiction at all. There are some notable problems, however. Leaving aside the movie’s gross (though depressingly common) misconceptions about how evolution works, there’s the crucial matter of what happened to all the smart people. The film’s premise is based on the idea that smart people were pushed out of existence because stupid people tend to breed faster. But that explanation starts to lose water with the realization that this is a corporate-run society leading everyone on by the nose. Are we really supposed to believe that the world was dominated by a bunch of total idiots? That the puppetmasters are no smarter than the puppets themselves? I don’t buy it. The way things are going now, a far more likely scenario would be for humanity’s evolution to branch into different paths, with an intelligence divide to mirror the class divide (see also: H.G. Wells’ “The Time Machine.”). Of course, these minor gaps in logic are the least of this movie’s problems in terms of storytelling. See, the central premise is explored by way of Cpl. Joe Bauers, played by Luke Wilson. He was chosen as the participant in a highly classified military experiment precisely because he’s more bland and flat than beige wallpaper. Somehow, these military scientists were able to empirically prove that Joe is completely average in every possible way, that’s how unremarkable he is. To find a female participant, the military looked to the private sector and found a prostitute (Rita, played by Maya Rudolph). And what is this huge super-secret experiment, you ask? A new technology to cryogenically freeze people indefinitely. The plan was to keep Joe and Rita on ice for only a year, but things went so incredibly wrong that the freeze pods were forgotten for 500 years until they were accidentally opened in a garbage landslide. They find a world overrun by morons and hilarity ensues. I’ll certainly grant that the cast is perfect from start to finish. This may be the only time when I can say that Luke Wilson is mediocrity personified and Dax Shepard looks and acts like he’s too stupid to breathe, and mean both as compliments. Maya Rudolph is underutilized as the female lead, though she still plays her role very sweetly. Terry Crews absolutely nails it as President Camacho; his performance is such a key part of this film’s appeal that Crews came on to reprise the character for a short series of internet videos during the 2012 election. Even the one-scene cameo roles — from Justin Long to Stephen Root to Thomas Haden Goddamn Church — are so exquisitely cast that every single one gets a laugh. Far more importantly, the satire works. The film is incisive and unmerciful in lambasting everything that’s currently wrong with us as a society. A huge part of why this works is because there is no single antagonist. Consider Office Space: You think the antagonist was Bill Lumbergh? No. The antagonist of Office Space was the nine-to-five. The drudgery of spending so much time sitting in a grey cubicle doing meaningless chores for people who couldn’t care less whether or not you even exist. Idiocracy does something similar by keeping its focus on the establishment. We’re always encouraged to focus our anger toward a rotten system, and never on the world or the people produced by that system. In a subtle way, this in turn encourages us to think about how this system got in place and what we might do to fix it. Unfortunately, the movie offers even less answers to its question than Office Space did. Though to be fair, finding a solution to a problem so huge that it seems practically ingrained into human nature is a tricky proposition. The best Joe can do is to get in a few words about creating things instead of merely consuming things, which is always a good message. Joe also talks a bit about how we should try encouraging people who want to make the world a better place, instead of laughing at their efforts or squashing them. You might think that would be a no-brainer, but it’s alarming how many people treat charitable intentions with apathy or outright derision (the current “ice water challenge” meme to raise money and awareness for ALS research is a fine case in point). Alas, this is about as subtle as the movie gets. Quite literally from the very first frame to the very last (not counting the useless post-credits stinger, that is), the film is overflowing with horrible narration from Earl Mann. Without exaggeration, I can say with confidence that this movie features the most unforgivably lazy use of voice-over narration that I’ve ever seen in any film. Not only does the narrator tell us things that could have and should have been conveyed in the story proper, but the narrator tells us what’s happening onscreen right in front of us. There is absolutely never any reason why any narrator should EVER have to recite a line of dialogue on behalf of a character who’s right there on camera. Shameful. Then again, the narration may be a symptom of a bigger problem. Between that and the bizarre editing (watch for a split-second cutaway to Rita while Joe is talking with her in the dust bowl), I’m led to wonder how many scenes were lost in the editing room. Between the intentionally botched release and the insufficient budget — as proven by some pitifully subpar effects work — I wouldn’t be the least bit surprised if Fox attempted to further sabotage the film by mandating cuts. The notion of a two-hour Idiocracy being cut by the studio into a 90-minute version seems all too plausible. But of course, I can’t prove that. Whatever the reason, the pacing, editing, and narration are all terrible. In short, Idiocracy is a movie that focused on conveying a solid theme, rather than telling a good story. I have a hard time holding that against the film — despite the wonky pacing and the godawful narration — because the ideas presented are that damned interesting. The satire is wickedly bold, exaggerating our lazy and brain-dead habits in such a way that Mike Judge seemingly dares us to try and do better. Of course, it also helps that a top-notch cast is on hand to keep things funny. The humor is a huge part of what makes this film work; the movie would easily have come off as condescending unless it put so much effort into poking fun at itself. That’s what makes Judge such a brilliant satirist: He has the unique ability to make deeply incisive comments about society, completely unafraid of offending his audience, and he can bring enough intelligent humor to get away with it. We need more filmmakers like him. And for all its faults, we needed a film like Idiocracy.